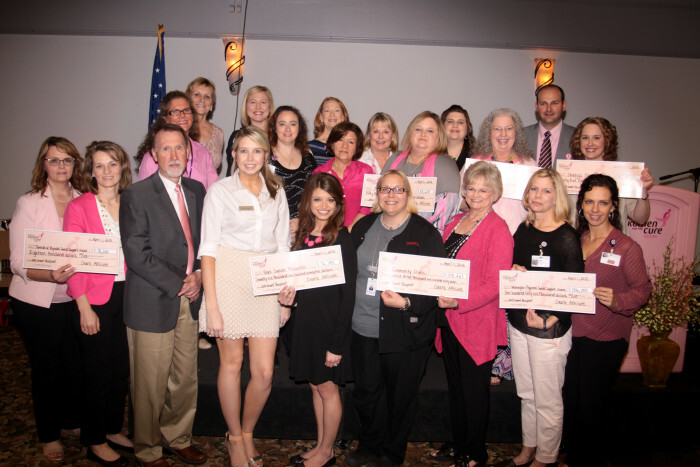 The Ozark Affiliate of Susan G. Komen announced Wednesday, April 1 at the Promise Circle Luncheon that it will grant $725,000 to fund 10 programs that will provide thousands of women and men with lifesaving breast health screening, education and treatment assistance throughout the next year. In addition to revealing the grant recipients, the Top Teams, Top Fundraising Teams, Top Corporate Teams, Top Friends/Family Teams and the Top 25 fundraising individuals from the 2014 Race for the Cure were recognized. The affiliate also awarded Clyde Hood the Jackie New Award for Volunteer Service on the Race Steering Committee and Dr Heather Schneller the Susan G. Komen Promise of One Award. “The Ozark Affiliate is excited to partner with the 10 local organizations to provide screening, education and treatment services to women and men in our 10 county service area who are uninsured or underinsured. At the Ozark Affiliate we want to make sure that ALL women have access to quality healthcare, regardless of the ability to pay,” said Lauren Marquette, Director of Mission Services at the Ozark Affiliate. The Ozark Affiliate raises funds through events like the upcoming Race for the Cure, which will be held on April 25, 2015 at the Pinnacle Hills Promenade Mall. To register for the race, visit the website at www.komenozark.org. The following programs have been selected for funding by the Ozark Affiliate. Applicants were selected by an independent grant panel through a competitive application and review process. For details about the Ozark Affiliate’s grant recipients, visit www.komenozark.org or call (479)750-7465. The “We Are Aware” program provides a culturally competent continuum of care for low-income, uninsured patients in Northwest Arkansas through breast care education, screening, diagnostic and treatment support. Outreach program called SISTA Supper, will educate minority patients through a small group setting where participants are able to ask the facilitator questions, schedule appointments and sign up for insurance. “To Save A Life-Survivorship” program provides breast cancer patients with support, advocacy, information, financial assistance and medical supplies, such as lymphedema and mastectomy supplies. Provides cancer support and education in Northwest Arkansas by focusing on access to support services with a focus on improving quality of life. The program covers genetic testing, housing, prescription and travel assistance. Provides a nurse navigator to advocate for breast cancer patients and educate the community on breast health. The program also provides gas cards, lymphedema supplies and coordinates support group meetings. Provides a nurse navigator to work with all breast cancer patients through their breast cancer journey. The program also provides gas cards and diagnostic services. Provides education, navigation services, community outreach program and partnering with diverse groups in the community to coordinate the access to a mobile mammography unit. Provides comprehensive education, outreach and awareness campaigns to increase participation in breast health education classes, breast self-awareness training and access to treatment. This program also provides screenings, diagnostic services, patient advocacy and transportation assistance. Provides support and assistance with screening and diagnostic services as well as coordinating mobile mammography units and navigating patients through the health care system. Provides access to breast care and cancer treatment for at-risk women by offering financial assistance for women in need of screening mammograms, diagnostic testing and transportation assistance. A nurse navigator is also provided to help those diagnosed with breast cancer navigate their journey. Provides a breast health navigator and a bilingual navigator who offer specialized guidance and support to patients on their breast cancer journey. The program guides patients through diagnosis, treatment and into survivorship while linking patients to financial and support resources as needed. Provides also provides screenings, diagnostic services and treatment support. Since the inception in 1998, the Ozark Affiliate has awarded over $8.5 million to local organizations to provide breast health services to uninsured and underinsured men and women in the 10 county service area. Breast health services include breast cancer education, screening and treatment programs and breast health navigators. In addition to the nearly $8.5 million funded locally, over $2 million has been invested in the Komen National’s Research and Awards program in search of finding a cure. Our promise is to save lives and end breast cancer forever by empowering people, ensuring quality care for all and energizing science to find the cures.